- James Raymond was adopted as an infant. In 1995 when Raymond turned 30, he decided to look for his birth parents. That’s when he found out that his biological father is David Crosby. They ended up meeting and becoming great friends and even better playing music together. They formed a band with guitarist Jeff Pevar named CPR (Crosby, Pevar, and Raymond) and have recorded two studio and two live albums together. The first song they co-wrote, entitled “Morrison”, was performed live for the first time on the CPR (Crosby, Pevar, Raymond) tour in January 1997. The tremendous success of the tour spawned a record project, currently waiting for release. The album will feature James’ fantastically unique singing, songwriting, and producing. A second leg of the CPR tour will later this year. James Raymond has been a major player in the music industry for thirteen years. He began playing and touring with various R&B and jazz recording artists, such as Take 6, Tom Scott, Everette Harp, Oleta Adams, Kirk Whalum and most recently, The Spice Girls. An accomplished writer, James went on to become musical director on the hit Nickelodeon series, “Roundhouse”, for all three successful seasons. He wrote an original song for each episode. During his tenure on the show, he was nominated two years in a row for a Cable Ace Award in the category of best original song. The collaboration between James and choreographer Barry Lather was too good to end there. Barry, noted for his choreography in the videos of artists such as Janet Jackson, Paula Abdul, and Sting, needed James’ groove on his instructional video series, Barry Lather’s Hip Hop & Funk. James has produced for several projects, including a song on the debut album of “Sovory” on Polydor Records. 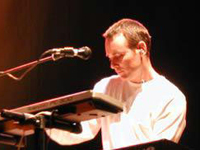 James Raymond was musical director for the first leg of Sovory’s tour, leading up to the album release. Eric Clapton called Sovory, “The best new artist I’ve heard in a long time.” Some of James’ other recent television work includes a brilliant arrangements of “Amazing Grace” for the CBS series, The Client and his first dramatic score on the 1997 Warner Brothers pilot, Justice League of America. Most recently, James scored the music for a drama series, “To have and to hold”. that aired on Wednesdays on CBS at 9:00pm. He also wrote the opening theme song, Anastsia Gonzales sings the vocals with David Crosby and James.